The presswoman is adjusting the typography to fit the design and paper just right. 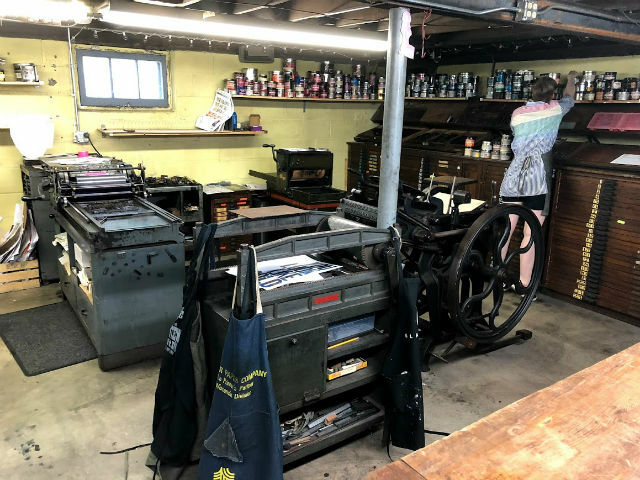 Published July 30, 2018 at 1:01 p.m.
A printing shop with antique presses still open in 2018? With technologically advanced printers available today – and also, you know, the internet – you'd think you'd have to strain your brain trying to come up with a need for an old fashioned letter press. But Bay View Printing Co. apparently has no trouble finding clients and fun projects. As someone who appreciates the history of the printing press, typography, crafting and all things words, I had to check out the homey little building at 2702 S. Howell Ave. The yellow paint on the wood siding was welcoming, and the colorful inspirational quotes and phrases on the side of the building were representative of the open, artistic nature of the business. 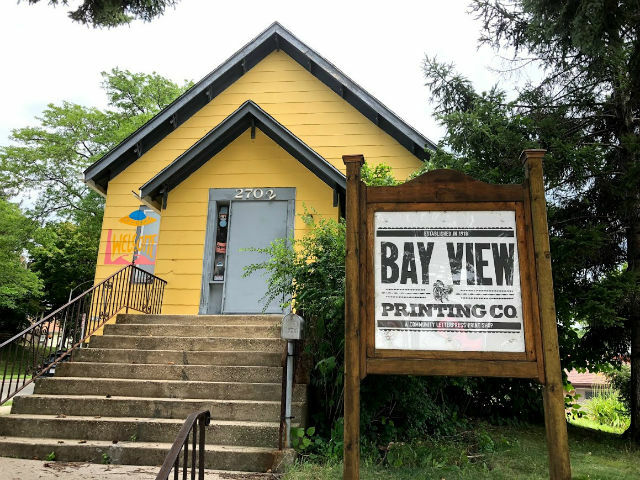 Bay View Printing Company's interior is as cute and charming as the outside. The first floor is filled with tables and lots of space to create (messy) projects. The walls going downstairs are littered with posters of inspirational, heartfelt and humorous phrases created on the letterpress. But the basement is where all the printmaking happens. I felt like I was walking into a museum – maybe my great grandfather's basement from another life or a time machine to the 1800s. Lots of machines lay scattered around the room, while towers and towers of uncountable fonts surround the machines. The possibilities really are endless. Projects are always in the works. I could see a pile of recently pressed, beautiful wedding invitations and envelopes to match. 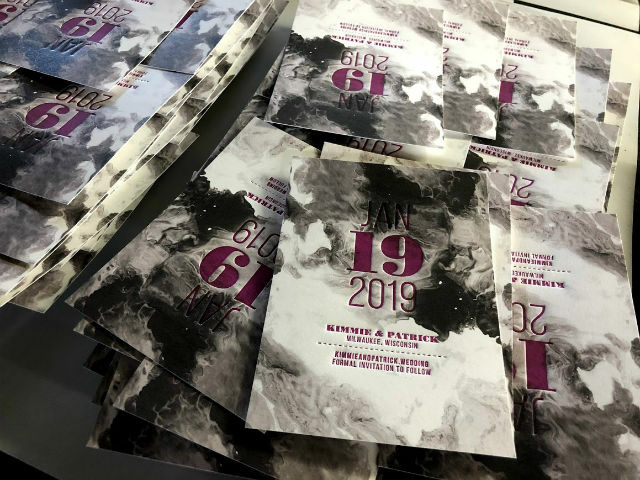 Lots of posters – some professional and complete, others pressed twice or three times with different phrases for ink testing – were also scattered around. Bay Viewing Printing Co. uses pantone inks and cotton paper to produce professional results, as well as imprints on paper to make fun textures. The shop offers business card services and branding, in addition to coasters, baby announcements, personal stationery, invitations, stickers, tags, custom greeting cards, paper flower bouquets, table runners, patches and many more creations. The shop also has lots of T-shirts, greeting cards and other items pre-printed for sale. 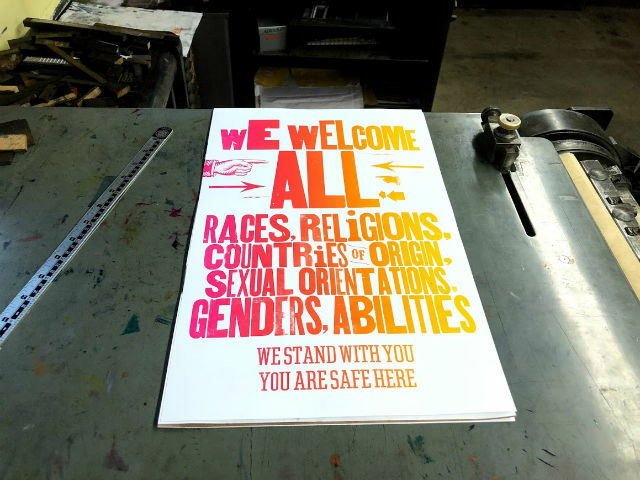 While touring around, I witnessed one of the employees creating a poster design that the shop already had on the press. I was mesmerized, watching her spread the ink onto the moving mechanical rollers, roll the ink onto the letters and then feed the poster paper through the machine. She pushed the paper roll through, and suddenly the paper was inked and the poster was complete. Interested in trying it out for yourself? You can sign up for different types of memberships, allowing you specific hours of open studio and access to members-only classes. The shop also offers a range of classes, from linoleum block carving, to greeting card making, to polymer plate printing and – because this is Wisconsin – Drink & Ink nights where you BYOB and make posters. The staff provides all the equipment, materials and teaching needed to help you make beautiful, professional pieces of art that'll stand the test of time.